It wasnt just any Elvis impersonator that Bernadette and David Mills landed when they tied the knot in Las Vegas last year. He was the most sought-after Elvis impersonator in show biz. The Burlington couple had eschewed a traditional ceremony at home for an elopement to Sin Citys famed Little White Chapel, where the walls are lined with red velvet. The King wannabe was part of the package, serving as both witness and entertainer. For people hoping to give matrimony a unique twist, eccentric wedding options abound. In the Nevada nuptials, Love Me Tender became Marry Me Whimsical. They also merged wedlock with instant honeymoon by visiting the faux Paris, Venice and New York cityscapes constructed in Las Vegas, a tourist destination devoted to artifice. Apart from two cave-diving instructors in attendance, Carter says the only other guests in the wedding party were uninvited albino crayfish and blind catfish. Carter and Whipple, who met five years earlier through their mutual passion for diving, chose to take each other for better or for worse at Peacock Springs State Park in Luraville  about 40 miles northeast of Gainesville. The park sits on a freshwater aquifer with 1000 miles of submerged limestone caves. They tried to exchange rings slathered with dishwashing liquid and carried in plastic baggies. Vaseline might have proved a better idea, though, because the soap immediately dissolved. Carter and Whipple had difficulty slipping the rings on each others fingers. Water was an element in the otherwise grounded wedding of Emily Hayford and Jean-Paul Bisson, University of Vermont graduates now living in Arizona. In June, the ceremony took place at the Trout Club, a turn-of-the-20th-century fishing lodge near Stowe. The best man then rowed the bride and groom across a small, manmade lake, which the guests circumnavigated along the shore in order to greet them. Ricky Bowen, who has billed herself as the Wedding Wizard for 14 years of planning such events, also had clients who opted for a splashy flourish during their celebration at Kingsland Bay State Park. Instead of driving away in a limo with tin cans tied to the rear bumper, they sailed off into the sunset, she says. Pasha and Lori Lemnahs civil union last fall was a step back in time. After the South Burlington lovebirds decided to make it official on Hallo-ween, Pasha sewed them both Empire-waist costumes with Renaissance flair. Loris satin dress was off-white and peach over a sheer peasant blouse, with a light green satin cape that had a three-foot train. Pashas more ornate brocade gown, in various shades of beige, was trimmed with lace and pearls; her beige coat included a one-foot train. 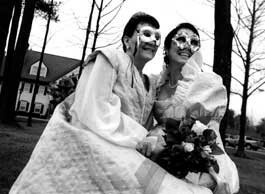 Both women wore masks that would have been all the rage in the 16th century, as did their two witnesses: Loris mother and Pashas 16-year-old son. Personal history was also a factor when Lisamarie Charlesworth tried to figure out how to marry Thomas Simpson on a modest budget last Novem-ber. With help from artistic colleagues, she made invitations by scanning the 1928 wedding photograph of her maternal grandparents. That was just one way the St. Albans couple brought the past into the present on their wedding day. Although the lace was still salvageable, much of the fabric on her grandmothers flapper-style dress had disintegrated  the garment spent more than 70 years wrapped in newspaper. Charles-worth decided to resurrect it. Her grandmothers veil was reconfigured as well; two bundles of pale wax flowers that had been fastened to either side were taken apart and fashioned into a halo shape. The original was too Princess Leia, Charlesworth suggests. Her diamond and sapphire engagement ring, meanwhile, had been given to a great-great aunt in the 1920s by a man she never actually married. At their recent wedding, Simpson  wearing a tie from his maternal grandfather with a tie clip from his paternal grandfather  put on a gold band that once belonged to Charlesworths grandfather, the chap on the invitation. In Milton two years ago, St. Pierre worked on a conventional wedding that wound up as a sports activity. Milk crates full of golf balls were produced. The guests, in tuxes and gowns, grabbed the clubs they had brought along and transformed a field into a fairway. Quite possibly nothing can top the relaxed  make that wacky  ambiance when Lisa and Larry Martin said their I dos at what was a second marriage for both. While the Jeffersonville duo staged a memorable festivity, Lisas recollection of the actual date is now a bit fuzzy. Perhaps 1991, she speculates. The justice of the peace, who happened to be their landlady, was decked out as Georgia OKeeffe and read vows attached to a painters palette. The best man had outfitted himself as Bozo the Clown. Lisa popped a long Pinocchio-like nose on her daughter Galadriel, named for the Lord of the Rings elf queen. But the highlight of the evening surely came with the fish slap dance that the Martins performed. Although they told assembled friends and relatives it was a French-Canadian rite of passage, the routine was actually inspired by an old Monty Python skit: As they executed a little jig, Lisa and Larry smacked each other with dead fish. Someone slipped her a big smelly cod, and I floored him with it, she says of the humorous husband-bashing. A fiftyish Stowe native and ad saleswoman for the County Courier in Enosburg, Lisa admits her unsuspecting parents were stunned. They also had to make sense of a wedding cake in 10 different flavors, with little plastic arms, mice, poinsettias and such sticking out from the blue frosting. If they could see it clearly, that is, what with the smoke machine emitting atmospheric fog all evening.